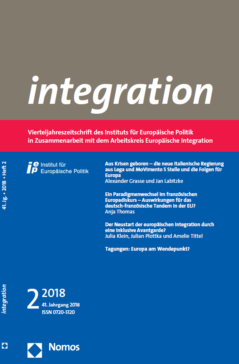 In the new issue of integration, Alexander Grasse and Jan Labitzke deal extensively with the Italian parliamentary elections of March 2018 and analyse the election results as well as their background, examine the government parties’ coalition agreement and the personnel composition and discuss the challenges for the EU in relation to the new government. Anja Thomas focusses on Emmanuel Macron’s speeches on the future of the EU. According to the author, for the first time ever Macron translates the domestic role of the French president as unifier of the nation to the European Union which marks a change of paradigm in the French presidential discourse on the EU. Besides, she also refers to the impact of Macron’s ideas on Franco-German leadership in the EU. Julia Klein, Julian Plottka and Amelie Tittel present selected results of the research project “The Relaunch of Europe”, where Germany, France, Belgium, Luxemburg and Spain turn out to be part of the group of member states that are willing to further deepen integration in all areas of the study. Carolin Marx and Janny Schulz report on the 2017 German-Portuguese Expert Meeting which was organized by the Institut für Europäische Politik as part of its bilateral dialogue formats. The results of the Italian parliamentary elections of March 4th, 2018, triggered lasting uncertainty in the European Union: initially, because of unclear majorities that resulted in three months of a “hung parliament” until the formation of the new government, and subsequently because of the political course of the new coalition between Five Stars Movement and League. This article analyses the election results, their background, and the twisting path to a new government. It examines the government parties’ coalition agreement from a European perspective and the personnel composition of the new Italian government. On that basis, the authors discuss the challenges for the European Union, Germany and France in relation to the Conte government. A Change of Paradigm for the French EU Discourse – Consequences for the Franco-German Couple in the EU? Emmanuel Macron has presented a number of speeches on the future of the EU which point to a fundamental change of paradigm in the French presidential discourse on the EU. For the first time, a French president tries to translate his domestic role of unifier of the nation to the European Union as a political entity. He addresses the Europeans as “community of destiny” and portrays the European Union as level of action without alternative. This change of paradigm may be positive for chances of Franco-German leadership in the EU. The type of symbolic politics Macron is playing has been a blank position in the EU for quite some time and could successfully underpin new initiatives. Their success, however, depends on the type of issue-coalitions among EU member states. The Relaunch of European Integration through an Inclusive Avant-garde? The Brexit referendum in June 2016 rekindled the discussion about the future of European integration, leading to a number of initiatives by different European actors. This article sums up the state of the current reform debate, showing that so far, only few specific reform projects have been initiated, before giving an overview over the results of the research project “The Relaunch of Europe”. The project compared the reform willingness and preferences of 27 member states in the policy areas of asylum and border protection, Economic and Monetary Union, Social Union and Defence Union. The results show that the group of members most willing to reform includes not only Germany and France, but also further founding states such as Belgium and Luxembourg, as well as Spain. Together, they are willing to further deepen integration in all areas of the survey and form an “inclusive avant-garde” remaining open for other groups of member states to join for particular policy areas if they are willing.